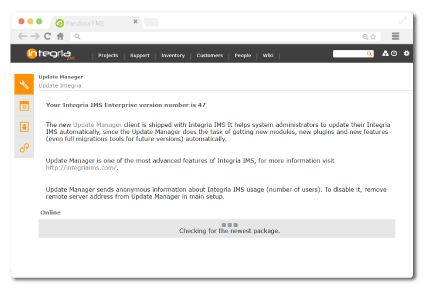 Integria IMS has its own update manager. This way, without having to access the operating system or having to perform any special action, you can update the tool easily in just a few clicks. We always maintain the intention of improving our software on each update. In these updates we always include error corrections, performance improvements and new features. Eliminated security vulnerabilities in some forms. ACLs from the People section. Loss of the description field in files attached to Contracts. Problem in the execution of workflow rules in real time. Error when loading custom fields in the Tickets creation/edition form. Loss of decimals in rectifying invoices. Problem in the notification of changes in tickets by email. Problem in the language selection in the Translated Strings section. Personalized fields of textarea type. Download of attached files of Contracts. ACLs applied to standalone users. Assignment of Tickets to disabled users. Use of custom fonts in text editor. Hide in the invoices the Fiscal Identifier field corresponding to the company. Failure to visualize HTML encoding. Creation of users/tickets through email. Mejoras in the contextual help. Mejoras in the formatting of data returned by the API. New user profile ‘Human Resources’ that allows the management of Work Units. New special task “Doctor’s visit” available for Work Units. It is now possible to attach files to Work Units. It is now possible to attach files to Projects. Calculation of hours assigned to projects when editing tasks of that project. Error in Personalized Ticket Filters. Error when adding profile to a user. Linked fields of ticket types are displayed incorrectly. Language selection in General Setup. Editing of mail configuration parameters. Notification to user creator of Ticket when they are opened through the mail. Performance in the Annual Calendar view. Be able to select items from the mail queue to modify or delete them. Problem when adding custom links. Calculation of sums in Invoice Report. Error when creating Contract with non-existent company. Export to PDF of Invoices. Wrong count of `Involved Persons’ in Resolution Report. Problem attaching files in response to Leads. Error when executing Workflow Rules in cron. Failure in the operation of the Translate Strings section. Error in the calculation of the’Hard limit’ in the creation of Tickets. Deletion of global custom fields of Tickets. New sources in Invoice Report. Visual improvements in modal windows of confirmation. New type of custom field for People. In addition to the existing fields, you can add linked fields. It is now possible to delete Wiki pages from the Administration menu. External type fields in Inventory. Sum of taxes calculated in Invoices. Entry of hours for holidays. Import of Custom Reports to CSV. Improved visualization of milestones in Gantt charts. Calculation of deviation time in Projects. Fixed issues that occurred after the upgrade to php 7. Upgraded to PHP version 7. PDF library upgraded to version 6.1 of mPDF. New user profile. In addition to administration user, grouped and isolated user, Integria has a new user profile grouped by Company. It is now possible to customize the logical operations that can be performed with the conditions of the workflow rules. Problem when deleting workflow rules. SQL error when creating users. Now you can attach files to Contracts generated from customizable templates. Sending of Tickets notification on demand. New conditions for the execution of Workflow Rules. Setting a hierarchy of Download Types in the Support section is now possible. New levels of access to the Clients section. Fixed the condition ‘Text string search’ of the Workflow Rules. User avatar upload in installations on Windows OS. Coding of line breaks in email notifications. Status selection in the Inventory search and form. Export of Custom Reports to CSV. User pagination of the People section. Management of user vacations within the People section. It is now possible to change the type and group of a ticket automatically using the workflow rules. Q/A information has been added to the Support Report. It is a new section where you can consult the score of each ticket. Log of activity of tickets and work units related to a task. New option to automatically assign a ticket creator to the first user to write a comment on the ticket. Option to export the Reports to CSV. Valuation of tickets by the user creator after closing. Display of texts from the Clients section. Display of total quantities invoiced by company. Display of user images that are sent by email in notifications. Broken link to Knowledge Base elements. Filtering in the ticket search. Incorrect counting of tickets belonging to ‘isolated’ users. Error when removing people from a task. ‘Parent’ field of a non-editable task. Creation of custom fields in the Contracts section. Simplificationo of the Projects menu. Edition of articles from the Knowledge Base. New home screen that includes a search engine for the Knowledge Base. Integration of eHorus with Inventory. New Ticket filter on Dashboard. Option that allows users who do not belong to any group to create Tickets. Group duplication is now possible. New API functionality. It is now possible to add inventory objects to an already created ticket. Solved problem in sending emails through workflow rules. Customized Contract fields can be grouped into sections. New functions have been added to the API. It is possible to choose the order in which the personalized fields of Tickets, Companies and Contracts are displayed. Creation of Inventory objects is now allowed without assigning an owner to it. Creation of Contracts without associated Company. Want to know more about Integria IMS?